“Madame Louise” was performed on Thursday 24, Friday 25, and Saturday 26 June, 1954, at the Theatre Royal. 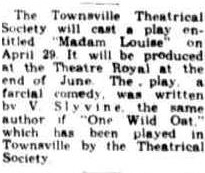 The Townsville Theatrical Society will cast a play entitled 'Madam Louise'' on April 28. It will be produced at the Theatre Royal at the end of June. The play, a farcial comedy, was written by V. Slyvine, the same author if 'One Wild Oat.' which has been played in Townsville by the Theatrical Society. Mrs L. Benstead, Joan Wilson. Townsville Theatrical Society opened a three nights' season in the Theatre Royal last night with the English comedy 'Madame Louise' and scored a splendid success. The society has every reason to be pleased with the presentation. 'Madame Louise' is the story of the proprietress of a London gown shop who, impressed by the success of her churchman brother in his little flutters on the horses, follows his example, but disastrously. The shop falls into the hands of Charlie Trout, a bookmaker, who has fallen foul of his protector, and uses the gown shop as a hideout. He becomes interested in the utility costume of Madame's former manager, Henry Mould. The story mostly revolves around Trout and Mould and provides much clever dialogue, in which the players are all heard to advantage. Mattie Mercer, as the drab Madame Louise of the opening stages and the smart successful woman of the finale, did splendidly. Bob Mahaffey, as Mr. Trout, was perfectly cast. His was the outstanding performance of the show. He was seldom out of the picture, and he kept the comedy moving at a nice tempo. Ted Smythe's Mr. Mould blended admirably with the performance of Trout. Penny (Mary Summerfield), Pearl (Mary Green), Eve (Joyce Blacker), Slim (Brian Wauchope) and Mrs. Trout (Pat Snell) all fitted smoothly into the story and did their work well. Others in the cast were: Ross Smith, Arnold Greske, Freda Greske, Estelle Miller, Judith Brackstone, Jack Ivanoff and Colin Horne. Altogether it was a splendid production, the comedy not overdone, and all concerned are deserving of congratulation. The production was in the capable hands of Rita Jell. Special incidental music was supplied by an orchestra under Mrs. J. Summerfield.